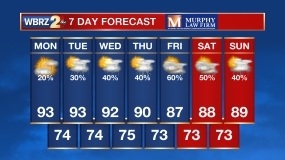 An unsettled week of weather will maintain rain chances through Friday. Perhaps the coolest air so far this fall is on tap for the weekend. Today and Tonight: The edge of a cold front will weaken over our area this morning, and scattered showers will become more spotty into the afternoon. High temperatures will top out around 82 degrees, followed by another cloudy, muggy overnight in the upper 60s. Up Next: More showers are in the forecast through midweek, as a front stalls across Louisiana and south Mississippi. High temperatures will stay above average through this period, hovering in the low to mid 80s. Conditions are set to cool on Thursday, with highs barely making it into the 70s ahead of a sharper cold front moving across the area late Thursday into Friday. This will keep rain chances elevated, but conditions will gradually improve through Friday as temperatures tumble. Clouds will break up, as much cooler air send thermometers into the 40s by the beginning of the weekend. High temperatures may barely get into the 60s each day this weekend. An upper level trough will remain situated across much of the country with series of shortwaves tracking through it. The first shortwave is currently passing through the Mississippi Valley. A weak cold front associated with this trough will approach the forecast area from the north on Tuesday. However, the Baton Rouge area will be on the trailing end of the boundary. The best ingredients for severe weather are well north of the area, in fact, thunderstorms are even questionable in the local area. Moisture ahead of the front is very evident with dewpoints in the low 70s and this will be sufficient to maintain muggy air and scattered rain coverage. The cold front will stall in southern Mississippi by the end of the day as the shortwave to the north lifts out to the northeast. The next shortwave will bring another front to the area by Wednesday night. This will once again increase rain chances, likely even higher than today. This front will stall as well, but possibly closer to the coast. Thursday will be persistent weather as the front will remain stalled. 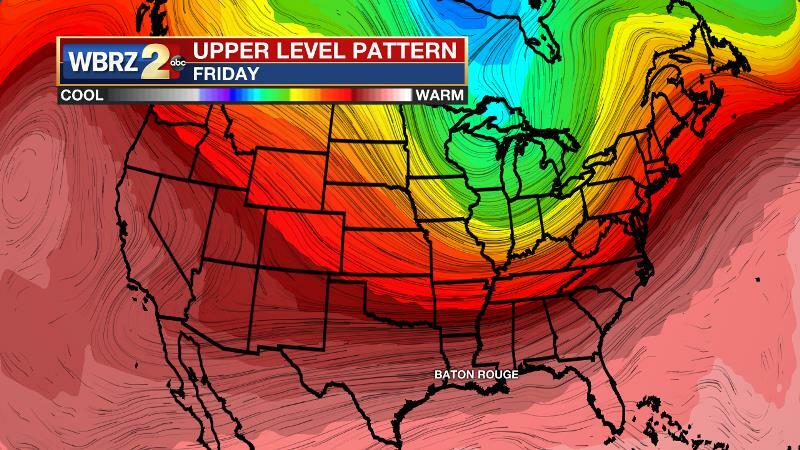 By Friday, the main upper level longwave trough will amplify, dig into the Southeast U.S. and push a strong cold front through the area into the Gulf of Mexico. This will end rain chances and usher in much cooler air beginning Friday night. This weekend will likely have highs in the upper 50s and lows in the upper 30s.